FORSETH – Three good questions about proportional representation in B.C. Really, do you go out and purchase an unknown bag of goods, when you go to the store, and then wait until you get home to see what they’ve given you? OKAY … there are three questions I’m wondering about, when it comes to British Columbians deciding on IF we change how we currently vote. And … if we do, what that new system will be. Why are we not getting an explanation of who will decide on the proportional representative going to legislature. As it stand now, they won’t be voter elected but potentially, at least, party hacks. Right now many / most of us complain that our elected representatives DO NOT in fact represent us; instead represent the party they belong to. Basically they do as they are told. On the other hand, maybe they will be voter elected, perhaps by using the votes each has received, and picking the one(s) who received the most. Are those not good questions — and how many more can you add to just this one first question? If an MLA resigns or dies, during their term in office, how will they be replaced? Will it be from the party slate? Will there be a General Election, and if so, what riding will it be in if they are a floating MLA responsible only to the party they represent? OR what other possible option, or combination of options might we be looking at? Hmmmmmmmm … no answer for that either. Why is the government not willing to show us what the riding boundaries will be, for each of the three voting options we are going to be able to choose from? I know, we’re supposed to trust them. Here’s the thing though, I’m not will to make the buy, without knowing what I’m actually buying. Really, do you go out and purchase an unknown bag of goods, when you go to the store, and then wait until you get home to see what they’ve given you? And they are right, of course. It is not the government that decides this … it is, or will be, an independent commission. HERE’S THE THING THOUGH. Any time we have had changes to riding boundaries (and they were generally jerry rigged), it was done prior to an election. In this case, our GreeNDP government is wanting us to change how we vote, PRIOR to knowing what the boundaries will be. I’m not really very comfortable with that. And, what’s the rush? We’ve been voting the way we have for decades and decades; what’s one more election? There’s still too many questions, and I for one am willing to wait to have a referendum, until we have all of the answers first — or at least answers to the majority of the questions I have first. IF we all have an understanding that there WILL be a FAIR referendum on how British Columbians vote (on the future make-up of the B.C. Legislative Assembly), then we can go into the next election knowing NO party will attempt to subvert that will. The NDP … The Green Party … the BC Conservative Party … the Liberal Party. ALL should be required to make that commitment. That’s the way it really should be, shouldn’t it, on a decision like this? 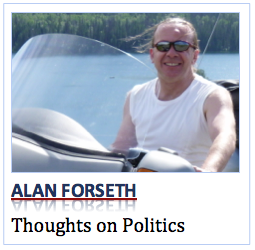 In Kamloops, I’m Alan Forseth … and I look forward to seeing your thoughts below in the Comment Section. 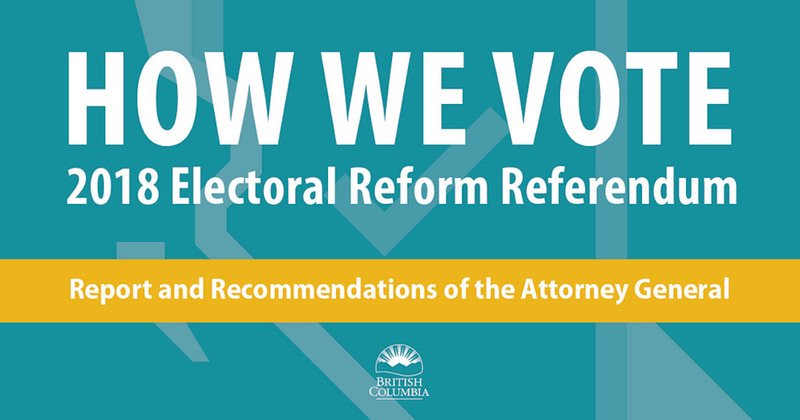 12 Comments on FORSETH – Three good questions about proportional representation in B.C. Some form of proportional representation is used in around 94 countries in the world, including, Ireland, which has had PR since 1922! Other countries are Norway, Germany, Finland, Sweden, Netherlands, Belgium,New Zealand, Denmark. Former pm of New Zealand, Helen Clark who recently spoke in Vancouver (see her talk on youTube, said she was wary at first, but found the government got a lot done with more cooperation between the parties. We don’t have to reinvent the wheel here in BC, and frankly, I am tired of our elected “dictatorships”. Provincially and federally. Valid questions, but not deal breakers. All the options presented guarantee local representation, exclusion of “fringe” groups, and, most importantly, inclusion of virtually every voter’s vote. Hopefully the benefits of Proportional Representation, and the fact that we will vote on whether to keep it after we have tried it, will give you the courage to vote Yes. Thank you for a thoughtful commentary. A few things for your consideration. The bag of goods isn’t completely unknown. You know, for example, that it contains milk and chicken breasts, as it always does. As always, you don’t know how MUCH milk and how MANY chicken breasts, nor do you know with any certainty that the milk doesn’t turn out to be soured, or the chicken breasts rancid. With this new bag of goods, you can be fairly confident it will also contain bananas and potatoes, and maybe even a dessert! Still, you won’t know the bananas aren’t blackened, the potatoes haven’t sprouted, or the dessert turned out to be ice cream that melted all over everything. This is where you still need to hold the packer of each item to account. Over time, the packers may come to realize it is not okay, or cost effective, to spend the next four years providing an inferior quality of goods, even with the most room in the bag. You don’t want to do this in a rush. That is good, since this country has been talking about electoral reform and proportional representation since at least 1921. We’ve had around 13 or 14 commissions, committee studies, citizen studies, etc. during that time, and they have ALL concluded that proportional representation is the way to go. I’d hate to see your definition of taking it slow. But mostly, I’m surprised at the faith you have in the political party back rooms. In spite of knowing that, today, party hacks are put into ridings where the wishes of the citizens of that riding are completely subsumed by the wishes of the party back room. Having 100% unfettered power is difficult to voluntarily give up. It is human nature, or at least political human nature. But, some can look long-term and realize that 100% power today isn’t worth zero power tomorrow, even the possibility of no party status as happened recently in Ontario. As we heard from Helen Clark, former Prime Minister of New Zealand, her party was against ProRep when it first came in. But after experiencing it for 21 years, she is now a strong proponent. Perhaps, as we learn from Samara’s exit interviews, it is because our politicians are demoralized by the realization they have been nothing more than friendly, well-intentioned puppets on a string. I expect they’d be happier if they could have had the pride of a shopping bag better filled. Entire populace, not just the two main groups. Why are those people so afraid or ignorant of consensus? Opponents often use Italy as a representative example of the worst outcome possible. Italy has always been -except for religion – a fractious society. Nothing has convinced me that proportional representation will be better than first past the post, I also have a real issue with the “for” sides stance that those of us against it are ignorant, uninformed, etc etc. 1. Why do skeptics of PR assume that there is a greater possibility that party hacks will be voted in from “closed lists” rather than the much more probable “open lists”? Further to that point isn’t it a fact that FPTP has always put “party hacks” up for election? Isn’t that the accepted ingrained nature of that system? Once elected aren’t those MLA’s ruled by their party leader who, through a party whip, exude nothing more than total obedience? Isn’t it true that FPTP governments typically have ridings with an MLA who represents only 40% of their voters? What happens to the 60% who didn’t vote for him/her and who end up with no representative? Is their assignment to the dustbin for 4 years how democracy should work? 2. If an MLA dies or resigns during their term in office what is the matter with a by-election held under PR rules? Isn’t it more likely that the person then elected would, through PR’s collaborative nature, represent a broader group of voters willing to contribute to consensus? 3. Isn’t the purpose of a referendum on electoral reform to decide, particularly, the answer to the referendum’s first question – ie Do we want to stay with FPTP or switch to some form of Proportional Representation? Once decided isn’t it a reasonable assumption that all parties – NDP – – – Green – – – Conservative – – – Liberal – would commit themselves to producing the best legislation possible for the voting public, not just for their party? So, at the moment, I can safely say that I have had to live with the undemocratic nature of FPTP my entire life, have usually been unrepresented both federally and provincially, am convinced that any form of PR is far superior in representing the increasing diversity of opinion than does our present system, and realize that any new system will have to resolve some of the nitty-gritty details over the two term testing period recommended. That’s why I will be attending the Fair Vote Kamloops presentation with Dr. Dennis Pilon of York University, July 4 at 7 p.m., at the Clocktower Theatre at TRU. His topic will be, “Changing B.C.’s Voting System, Arguments and Facts.” Much like Mr. Forseth I seriously recommend you make this part of your research into this important issue. Certainly my foremost objection to voting for change is the naming of party hacks from a list known only to the party. Never will I ever sit still for that. All this talk of party hacks makes me think that voters don’t realize that our current system gives us closed party lists that are exactly one name long — take it or leave it. At worst, this would stay the same under PR — the names would be on the ballot and have been decided by the party. At best (and this is the most likely option, IMHO, since no one is advocating closed party lists) we would have competition among candidates from the same party. Doesn’t that sound like a breath of fresh air? Can someone explain to me how this whole “party hack” thing could possibly get worse under PR? Sorry, but your column is just more useless blather from someone that is scared of change. Grouchy is an apt name it seems. I have indicated I am MORE THAN willing to consider change — I’m simply not willing to “buy a pig in a poke**”. I have indicated this so far that I am indeed planing on attending the Fair Vote Kamloops presentation taking place July 4th. The questions I have posed, and those of others, deserve to have answers. IF we are going to change how we DEMOCRATICALLY elect our representative, it is only fair we know fully what that entails. I think my example of buying a pig in a poke could potentially (at least) be apt given the information which is still missing. ** The idioms pig in a poke and sell a pup refer to a confidence trick originating in the Late Middle Ages, when meat was scarce, but cats and dogs were not. The scheme entailed the sale of a suckling pig in a poke. The bag, sold unopened, would actually contain a cat or dog, which was substantially less valuable as a source of meat. The French idiom acheter chat en poche refers to an actual sale of this nature, as do many European equivalents, while the English expression refers to the appearance of the trick.